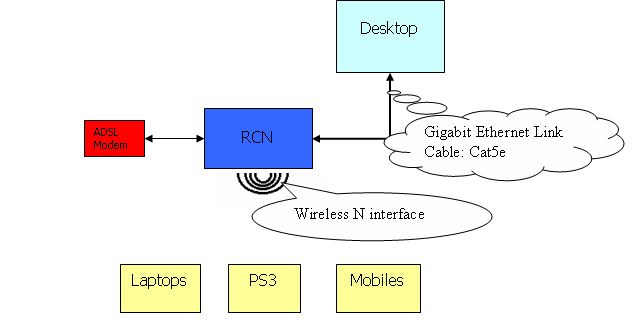 This is the followup post of Router/Network Storage Server. Here I document about the different software used to make my RCN. Here is the different pieces needed. There are two open source choices BSD (FreeBSD) or Linux(ubuntu). After few days of analysis I decided to go with Linux - because in my work I use FreeBSD. In either case I didnt want to use FreeNAS or OpenFiler or anyother ready made distro. Since I am familiar with Ubuntu - I decided to use it - the Ubuntu server version. Since there is no optical disk, installation should be through network or USB. Since most of the Linux distributions supports that I decided to use USB. Boot the system with boot media - My dual port monitor and wireless keyboards came handy in this situation because I could switch between Windows and Linux installation. 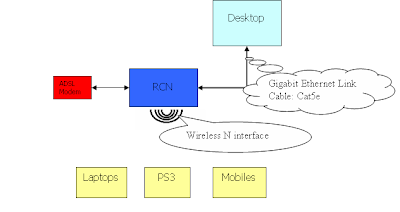 Since this device will run without any Monitor and Keyboard only way to communicate with the system is through network interface. Having SSH access is good but still having a web interface for common administration access is better. Few Linux applications are available for that my choice is Webmin. Shutting down the system should be easy. Since the storage is connected to the system it cant be power off directly. The file system data should be syncd first. Using command line or web interface is not realistic. So programming the ATX power switch is the only way - acpid does that. The goal was to create file based storage which is accessible from my home network. The NAS server should be big enough for atleast next 2 years. It should be fast enough to view videos from it without flickering. It should have hardware fault tolerance. It should have a back up facility. Space: 1TB is big enough for me. Backup: cron job to write create compressed tars on external disks? Need to explore other better software availability. Although few of my desktop boards had RAID option in the BIOS menu, I never used it and never explored it.I thought RAID chipsets in a motherboard is equivalent to RAID controllers/adapters. It was one of the decideding factor I favoured for Gigabyte(GA-D425TUD) motherboard with JMicron RAID chipset over Intel(D525MO) motherboard. After configuring RAID in the BIOS and starting Linux I realized it is not true raid. Because Linux recognized as fakeraid. In simple terms fakeraid is a firmware based RAID. That is all the work is still to be done in software yielding no performance benefit. Advantage of fakeraid is multiple OS which runs on same box can utiltize the same RAID. Since my setup wont have multiboot option, I dont want the fakeraid so decided to go with pure software RAID 0. Use webmin to configure samba “Servers”->”Samba File sharing”. Add the storage mount point here. The routing functionality is very simple - handle all 3 interfaces with some limitations. All interfaces are in different networks. All interface should get static interface while booting up. This router should provide dynamic IP to the other machines. Still few work is pending to make the desktop to connect to network - NAT and Firewall. NAT is required on eth1 to translate addresses on any outgoing packets and incoming packets. Now it is time to setup the wireless interface. Assuming the wireless are drivers are present in the kernel. The other tool requied is hostapd. hostapd implements IEEE 802.11 access point management.